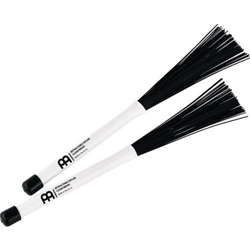 Retractable Brushes for Your Cajon! Want to hear just what your cajon can do? Check out this Meinl Retractable Cajon Brush set! These 13" sticks feature bundles of thick nylon bristles that deliver a crisp snap and sharp attack when you use them to play your cajon. The retractable bristles help keep your brushes in good shape between gigs. Remix percussionists were particularly impressed by the snare-like sound you can get from these Retractable Cajon Brushes, offering access to an extended range of tones even on traditional cajons that don't have wires or strings. Best of all, the polymer bristles are totally safe to use on nearly any cajon.